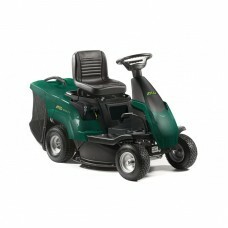 The Rider 27M is suitable for gardens up to 0.75 acres. With a Briggs & Stratton 875 Series ES Pro engine and manual gearbox, it has a 66cm working width and 6 cutting heights from 30mm to 76mm. The 150 litre capacity grass collector can be emptied from the driving seat. A mulching kit is available as an optional extra. The 66cm working width cutter deck features a safety brake with manual blade engagement and has 6 heights of cut from 30mm to 76mm. Clippings are discharged cleanly and efficiently into a rear mounted 150 litre capacity collector which can be emptied from the driving seat. An optional mulching kit is available so that when conditions are suitable you can eliminate grass collection and recycle the clippings which will save you time and return valuable nutrients to the soil.